My students love reading poetry! I have used this with middle school and high school students to engage them in meaningful conversations about all types of poetry. 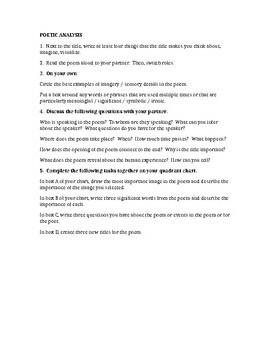 Page one is a reading and annotating guide, where students read the poem to their partner, then trade roles. They annotate the poem on their own prior to discussion. Topics for discussion are included. Page two is a quadrant chart with directions for choosing images, important words, generating questions, and new titles. This handout works well will all the poems you can find in SpringBoard, textbooks, POETRY 180, and even the poems that students compose in class. I've also used it with poems from our school's literary magazine. It's a doc, so you can edit it. Great SUB activity! Give the kids a copy of the poem--Kipling's "If", anything by Billy Collins, Poets.org Popular Poems to Teach--have all worked well this year. This could be modified for groups larger than two or for a jigsaw activity.